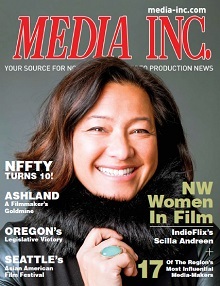 Longtime Pacific Northwest publication Media Inc. has announced it will re-focus its content and increase its editorial resources to provide exclusive coverage of the region’s film and video production industry. Media Inc. has been an industry leader for thirty years, covering the Pacific Northwest creative, film production, marketing and advertising industries. The re-formatted magazine and digital edition will now provide dedicated coverage solely to the region’s film and video production industry. As part of the magazine’s new focus, the editorial staff has grown, with the addition of Seattle-based Executive Editor George Riddell and Portland-based Associate Editor Susan Haley.